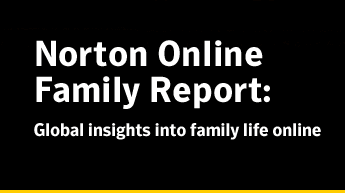 The findings come from Norton's Family Report, an annual survey carried out by the security company, which questioned 2,800 children and more than 7,000 adults worldwide about their online habits and behaviour. The study found that children spend an average of 24 hours online every week, while more than half of those questioned said they had been bullied online, exposed to inappropriate content, or encouraged to meet up with someone they knew from cyberspace in real life. “This report provides a rare glimpse into the online lives of young people in many countries – in their own words," said Anne Collier, co-director of ConnectSafely, a cyber-safety organisation that collaborated with Norton on the research. While university budgets globally wither, spending on educational technology is alive and well. From IT teams to instructional technologists, academic staff are disproportionately successful at garnering funds for lecture capture initiatives amidst an overall environment of financial cuts. Want to know why? And how these colleges are doing it? Sean Brown has 16 years of product management and education business development experience at IBM, Apple and Oracle before coming to Sonic Foundry in 2002. Mr. Brown is a past president and board member of the Hopkins Foundation for Innovation in Education. His core focus is simplifying digital media to improve use and outcomes. Schools rely on Wimba to provide flexible, cost-effective expansion of virtual supportand service offerings, and continued collaboration. Wimba® Inc., a leading provider of collaborative solutions for educators around the world, announced today that colleges and universities are increasingly turning to the capabilities of the Wimba Collaboration Suite™ to meet growing demands for enhanced help and support services. By providing collaborative solutions that support a 24/7 online environment, Wimba makes it possible for schools to deliver academic and administrative help - whether through the expansion of help desk support, online tutoring, informal instruction opportunities or other campus services - to students, faculty and staff whenever and wherever it is needed most. The School of Education at Drexel University now hosts an Online First-Year Experience via Wimba for their online and blended learning master's and doctoral students. For the first event, a Virtual Tea Orientation, the school distributes tea sachets to every student along with an invitation to meet live using Wimba Classroom™. "Forward-thinking educators are continuously examining ways to effectively and affordably reach students throughout their engagement with an institution. Our customers are using Wimba's intuitive technologies to engage the learner like never before. From orientation and pre-admissions counseling to expanding help desk and other support services online, Wimba helps colleges increase service utilization and maximize resources. It is this type of innovative thinking that will allow colleges and universities to reach more students and optimize learning without compromising the bottom line. ", said Carol Vallone, CEO and Chairman of the Board at Wimba. The survival of Becta and the critical role training plays in the use of ICT have emerged as teachers' priorities in an online Guardian poll on the future of schools technology. In the poll, launched a week before the government announced its intention to scrap Becta, 48% of respondents to date viewed the education technology agency as the most valuable government education body while its home access programme to provide computers to poor families was the most popular initiative for retention. The strong backing for Becta has been welcomed by its chief executive Stephen Crowne who says it reflects the "dedication and expertise of Becta staff which has helped shape the use of ICT in schools and across the further education sector". Jeff Smith, head of Anson primary school in London, which won a Becta ICT Excellence Awards in 2009, says losing the agency would deprive schools of a valuable source of specialist advice vital to supporting teaching and learning and e-safety. In a move that has sent shock waves throughout the education technology world, the British Educational Communications and Technology Agency (BECTA), which has been a leading international voice in research and support for using information and communications technology (ICT) in schools, is shutting its doors—a victim of the new U.K. government’s cost-cutting measures. BECTA’s closing could leave many U.K. schools on their own as they struggle to integrate technology effectively into teaching and learning, and its absence could be felt in the United States as well, observers say. However, last month a new political administration came into power in the U.K., putting in motion the Treasury’s decision to close BECTA by November 2010. The move is part of the new government’s plan to cut 6.2 billion pounds from the national budget for fiscal 2010-11, a plan necessitated by the global financial recession, officials say. According to the U.K. newspaper The Guardian, the staff at BECTA’s headquarters anticipated cuts and job losses, but few were prepared for the 12-year agency’s closure. The closure will mean the loss of 240 jobs—and the loss of what BECTA Chairman Graham Badman said are valuable ICT services for schools and their students. Denmark, the World Cup, and eLearning. Greg Pallis has been in touch to share with us this nicely free online game. 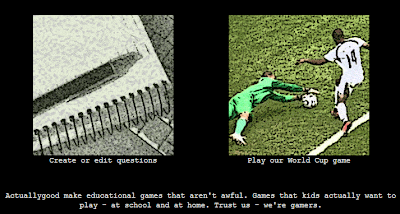 "It's a nicely free online game, in which you try to win the World Cup as any of the 32 nations - by answering questions on tricky spellings, spanish verbs, science facts, world capitals... or whatever else the teacher decides on. Teachers and adult users can easily create their own quizzes on the site, and set the game to run using those instead, so it hopefully has lots of uses for learning at a variety of levels. My students were extremely keen when I used it with them, so I'd like to spread the love and see if other teachers get the same response." writes Greg Pallis. 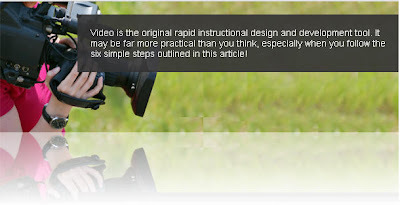 Check out this six steps to great instructional video below. "Like most instructional designers, I’m very excited about the possibilities of what will become the future of online education. One day, immersive online worlds and serious games might be the future of online adult education." writes Jeremy Vest of Learning Solutions Magazine. Bay State College Enhances its Online Programs with it's learning. The user-friendly features of it's learning will help Bay State supplement classroom delivery, offer hybrid and fully online course delivery, and improve the overall learning experience for students. Bay State also plans to use it's learning to support campus-wide efforts to dramatically reduce the amount of paper being used by the school. Please take a look at nilsh e-learning blog. Nils Hjelmervik, Bergen, Norway is e-learning adviser and project manager in the Norwegian company it's learning. Bay State College is a private college established in 1946 and accredited by The New England Association of Schools and Colleges, the Accrediting Bureau of Health Education Schools and the Commission on Accreditation in Physical Therapy Education. The College's mission is to provide students with a quality education that prepares them for professional careers and increasing levels of higher education. Bay State College accomplishes this mission by providing a learning environment where teaching excellence and student services are blended to support the uniqueness of individual students, preparing them to achieve their full potential as ethically and socially aware citizens. Further information is available at www.baystate.edu. EdTek partners with small to medium-size education providers and offers consulting, training, hands-on administrative support and technology solutions that enable its clients to focus their resources on instruction and learning. By offering solutions for Online Learning Software, Instructional Design, Course Development, Faculty Recruitment and Training, Enrollment Marketing, Retention, Program Management & Program Accreditation, EdTek helps smaller colleges deliver the same quality of education and experience as the leading education providers. Further information is available at www.edtekservices.com. Since 1999, the company has provided it's learning - The Individual Learning Platform(TM) to European clients in K-12 and higher education. In order to provide more effective service to North American schools and universities, in the spring of 2009 it added a North American headquarters in Burlington, Massachusetts. In additional to its global headquarters in Bergen, Norway, the company has offices in the United Kingdom, Sweden, Denmark, the Netherlands, Germany, France and Spain. Investing in the future of education, in 2009, it's learning dedicated more than 40 percent of its revenue to the design and development of its products. The company's goals are to offer the best learning platform and related services worldwide and to be the most innovative organization within the education market. For more information visit, www.itslearning.net.